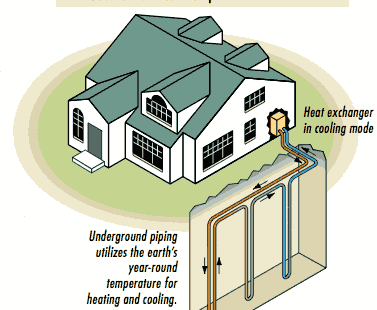 Geothermal heating and cooling uses the Earth to keep your home comfortable all year round. While our climate is among the mildest in Canada, heating and cooling a home is still a concern for many homeowners. The cost of utilities has always been on the minds of homeowners, but now, the environmental impact of conventional heating and cooling systems is also a concern. Using the Earth as a way to regulate home temperature is now a viable way to address both of these issues. Commonly referred to as geothermal heating and cooling, the process of using the Earth’s temperature to affect a home’s temperature is done through the use of a underground pipes and a temperature exchanger. So how does it work? Underground, the temperature isn’t easily affected by weather and sunlight so it remains constant all year round. An exchanger (also known as a heat pump) is what allows a home to take advantage of the difference between the underground and the open-air temperatures. Pipes (known as ground loops) connected to the exchanger and containing liquid are sunk into the ground where they passively take on the temperature of their surroundings. The exchanger tempers the air with a conventional system to be distributed throughout a home. A geothermal system can help to both heat and cool a home. During hotter months, the open-air temperate is warmer than the underground temperature. The temperature exchanger is then able to transfer this cooler air into the home’s system and helps keep its internal temperature at a comfortable level. There are major benefits to having a geothermal system in a home. The cost benefits are very apparent over the long term. A geothermal system is initially expensive to install but the reduction of electricity bills makes it economically viable. By not solely relying on electric heaters or gas furnaces, a home equipped with an eco-friendly geothermal system will also generate less greenhouse gas. We love nurturing healthy living environments. Combine this with passive planning techniques, like cross ventilation, and you have taken quite a burden off your home’s mechanical system.